Heat oven to 450°F. Bake pie crust as directed on box for One-Crust Baked Shell using 9-inch glass pie plate. Cool completely, about 30 minutes. In small bowl with electric mixer, beat cream cheese, 1/3 cup caramel topping and the icing sugar on medium speed until smooth. Spread in cooled pie crust. In 1-cup measuring cup, dissolve instant coffee in 1 tablespoon hot water. Add enough cold milk to make 1 cup liquid; pour into large bowl. Add pudding mix; beat with whisk until smooth. Stir in 1 1/2 cups whipped topping. Spread over caramel layer. Cover with plastic wrap; refrigerate at least 2 hours to chill. 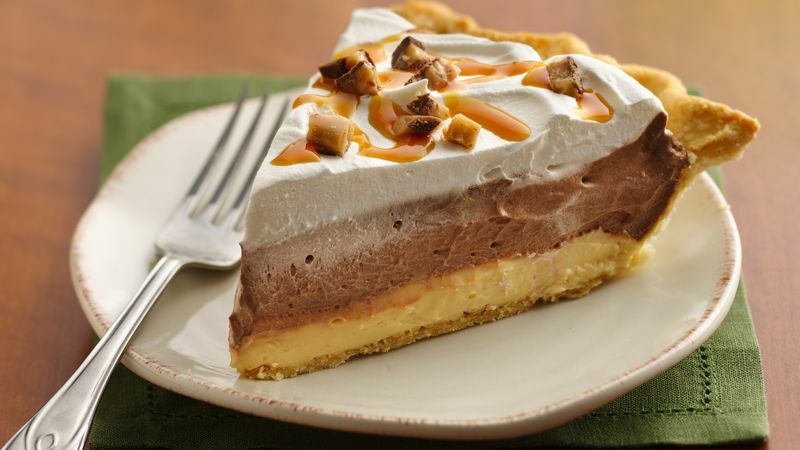 Before serving, remove plastic wrap and spread remaining whipped topping over top of pie. Drizzle with additional caramel topping. Sprinkle with chopped candy. Cover and refrigerate any remaining pie.